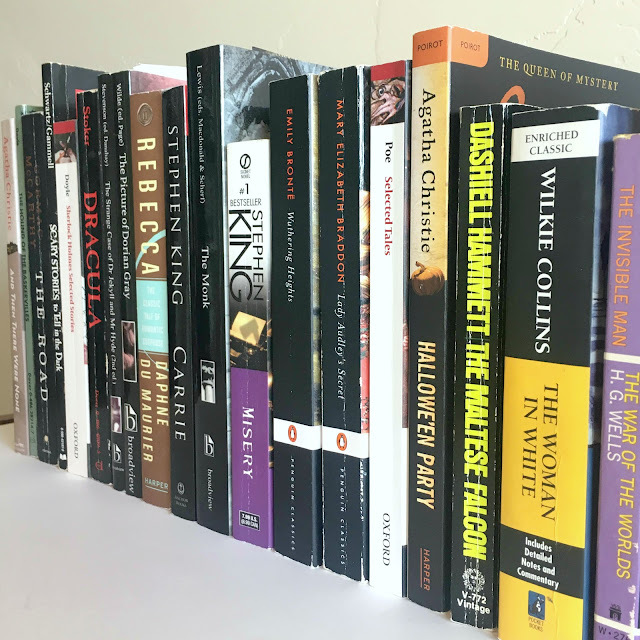 It's October, Halloween is upon us, the weather is turning cold, and it's the perfect time of year to pick up a Gothic or mystery novel. I love it when it's dark and windy outside, you can hear the cold rain hitting against the window panes, and you're wrapped up in your favorite blanket lost in a good story. Last year at this time I came up with a list of "31 Halloween Movies (For Those Who Don't Like Horror)." This time, however, I thought I'd cut right to the chase and list some books full of ghosts, paranoid narrators, monsters, and more. A warning: as many of these novels are Gothic, mystery, horror, or crime-related, some of the content is disturbing. That may mean that many of these books are not suited to all audiences. Do some preliminary research, read lengthier reviews, or ask around if you're worried about content. These stories really have it all and not all of it is "good." I've included a few innocuous children's books, but I've also included several popular Halloween reads that contain disturbing passages. You've been warned. A governess cares for two orphans in the country and soon fears someone or something is out to attack her and the children. Highlight: Sometimes not seeing something can be scarier than seeing it. The original account of blood-sucking monsters come to prey on men, women, and children. Highlight: Blood transfusions have never been so creepy. A group of strangers gathers at an old estate to test if it's haunted. Highlight: Holding hands with a ghost will freak you out. A young girl and her sister are the only remaining survivors of arsenic poisoning. Worse than that? One of the sisters is guilty. Shunned by the town and trying to survive locked within the walls of this castle, they'll try to survive until murder strikes again. Highlight: Don't eat the sugar. The original tale of strangers lured to a cut-off location and how each dies one by one as predicted by a children's nursery rhyme until then there were none. Who's the murderer and why have these victims been called here? Highlight: Having no clue what's happening or who's doing it. As children, neighbors, family, and friends gather to decorate and prepare for an upcoming Halloween party, thirteen-year-old Joyce Reynolds brags that she once witnessed a murder. Though many dismiss her outlandish claim as a cry for attention, at the end of the party her body is found murdered. Highlight: Scary children. Viktor Frankenstein mourns the loss of his dear mother and after witnessing lightning striking a tree, wonders if a dead corpse can be reanimated. His creation--treated as a monster--is abandoned at birth and must teach itself to communicate while hunting the man who refused to be his father. Highlight: Feeling bad for a monster who speaks French and reads classic literature. Rebecca is the second Mrs. de Winter and is haunted by the memory of her husband's first wife as she tries to live in her shadows at the Manderley estate. How did the first Mrs. de Winter die? Rebecca has to find out. Highlight: The quiet, eerie calm that threatens to boil over page after page is sheer perfection. A Londoner spies on a young married couple each day she passes them on the train until one day the wife goes missing and our train-rider's amnesia makes her worry she's somehow involved. Highlight: Wondering if the drunk, unreliable narrator is a victim or a villain. A monk is tempted by one of the devil's demons. The Gothic background of haunted castles, ghosts, closed passageways, and mystery predates the nineteenth century yet demonstrates the horrors of a twenty-first century mind. Highlight: The entire second chapter is a long and delicious tale of fright and when you finally meet the devil's disciple, she looks like she raided David Bowie's wardrobe. The Victorian era's greatest sensation novel, a tale of deception, bigamy, and murder. Highlight: Upper-class ladies are not always what they claim to be and neither are their husbands. Author P. D. James picks up Jane Austen's Pride and Prejudice just a few years after its famous conclusion and adds a new twist: a death has occurred on the Pemberley estate and all of its men are suspects. Highlight: Revisiting a beloved Romantic-era tale with a mystery added in. Hammett's novel is completely misogynistic, but his tale of a series of murders and thefts related to a priceless black statue is a defining moment in the creation of the hard-boiled detective crime genre. Highlight: Seeing the development of a genre. When a reclusive author meets his number-one fan, his life will never be the same. Neither will his nightmares. Highlight: Unbelievably terrifying. A bullied and abused teenage girl develops paranormal powers as she wreaks havoc and attempts mass vengeance on her small town. Highlight: Reasons never to bully someone nor attend a prom. Though Dr. Jekyll is one of the most respected men in London, friends fear his association with a hideous man known as Mr. Hyde foretells great danger. Highlight: Your doppelganger will get you if you don't watch out. Young Coraline steps through a forbidden door in her house only to discover another family on the other side, eerily similar to her own. Highlight: A Stepford Wives eerily calm quality. Bod not only lives in a graveyard, he's the only human resident. Highlight: Cool setting. When Dorian Gray sits for a portrait, he fears he will never be able to maintain the health and beauty rendered in the painting. When he makes a supernatural vow to never lose his youth, he faces the consequences of eternal agelessness and a darkening portrait that threatens to betray the secrets of his sold soul. Highlight: When art attacks. There are so many great ones to enjoy, but be sure to check out "The Fall of the House of Usher," "The Murders in the Rue Morgue," "The Tell-Tale Heart," "The Pit and the Pendulum," "The Cask of Amontiallado," and "The Purloined Letter." Highlight: You'll never look at ravens the same way. A blend of Victorian detective, mystery, and sensation novels, the story follows a sleuth trying to piece together the truth about a lost woman dressed all in white who has seemingly escaped from a mental asylum. Highlight: Great characters, including Count Fosco. You'll want to wax your mustache ends while reading his lines. It's the post-apocalypse and a father and son are doing their best to hide from blood-thirsty survivors. Highlight: A haunting mood that makes you check behind you to see if you're being followed. The scary stories kids used to read to each other during sleepovers in the 80's and 90's. Highlight: The creepiest drawings are found in the editions illustrated by Stephen Gammell. While I admit I lost interest in book two of this series, the first installment is a wonderfully odd account of supernatural misfits drawn together to fight evil. Highlight: Riggs' inclusion of odd 19th- and 20th-century black and white photographs. The story of a home on the English moors, the legend of a hell-hound, and death on a moonlit night. Highlight: The setting. You can start with A Study in Scarlet, the first murder-solving case featuring Sherlock Holmes and Dr. John Watson at 221B Baker Street, or just bounce around titles at random. Be sure to check out The Speckled Band and The Red-Headed League. Highlight: Picturing Benedict Cumberbatch and Martin Freeman. The turn-of-the-century tale of aliens invading our planet. Highlight: Victorian paranoia imagining when Mars attacks. Perfect for young readers or old fans who'll enjoy a nice trip down memory lane remembering when trick-or-treating was simpler and safer than it is now. Highlight: Candy and living in a hollowed out tree. Somehow I seem to miss this every year when it's shown on TV so it's to the bookshelf I go! Highlight: Linus. The tale of Catherine and Heathcliff, their doomed and unnatural love, and the downward spiral of the adjoining generational tenets of Wuthering Heights and Thrushcross Grange. Highlight: Heathcliff digging up Catherine's body to find her body has been unaltered by death. Catherine Morland thinks she's living in one of the Gothic novels she adores. Is she paranoid or are her suspicions on the money? Highlight: Romantic-era satire. What do you like to read this time of year? October Sky, by Ray Bradbury. Brilliant. Recommend. Thank you! I'll add it to my to-read list right now.